Aqua Bath Coatings provide a professional service across a range of commercial clients, with the repair, restoration & re-enamalling of baths and sinks. Our master craftsman can repair any type of bath, including Cast Iron, Pressed Steel, Acrylic, Roll Top and Slipper. We can even recolour a bath suite. Whether you are looking to repair a bath or sink unit after prolonged geneal wear & tear, accidental damage, restoring a reclaimed or previously unloved bath, or you’re looking to bring some showroom sparkle back to a feature piece, Aqua Bath Coatings can help. Aqua Bath Coatings provide bathroom suite repair & restoration services with a high quality service and finish at an affordable price. Delivering an unobtrusive, discreet, professional and efficient service, ensuring minimal disruption to your business or property, repairing & restoring your bath in situ, extending the life of your bath and returning it back to it’s original glory. 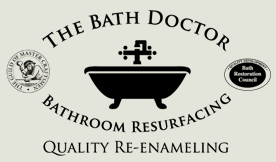 We are approved members of The Guild of Master Craftsmen and the Bath Restoration Council. Contact Aqua Bath Coatings today to discuss your commercial requirements. Contact Stephen at Aqua Bath Coatings today to discuss your individual or commercial requirements. Discover more about Stephen Lowe, the skilled craftsman behind Aqua Bath Coatings. Contact Aqua Bath Coatings today to discuss your individual or commercial requirements and to obtain a free quotation. We provide re-enamelling & restoration solutions for a range of commercial clients, including Hotels, Home Builders, Councils and Private Landlords. As a result of years of experience we realise you'll have plenty of questions, some of which we may be able to pre-empt in our FAQ's page for you.